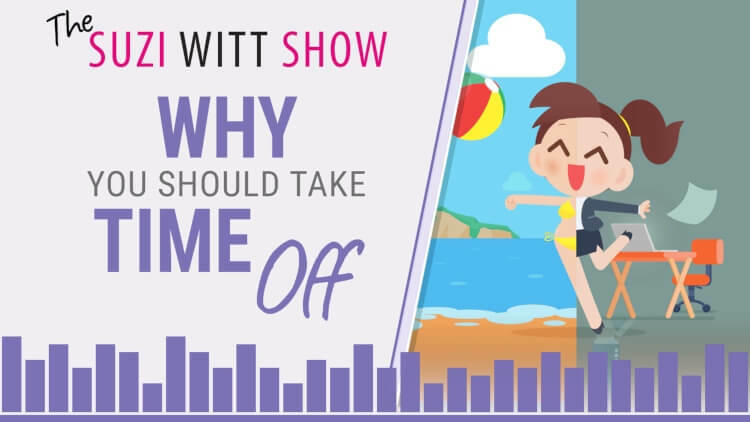 In episode 23 of the Suzi Witt Show, I popped into the studio to record a little extra session on the power of taking time off and having time away from your business. We are so often made to feel like the only way to really succeed is to put in really long hours and aim for a virtual burn out to be "successful". But, if you follow this path you can miss some real learning opportunities. Tune in to this week's show to find out the how, the why and the when on taking time away from your business . Find out why I am 100% relaxed whilst in one of the busiest periods of my career and how I get to feel like that. Understand more about what happens when you take time off in terms of your mental processes but in a simple to understand way. Learn why I think long hours make a difference but why missing out on certain chances can ultimately stop you progressing or slow your progress right down. Listen in to why I think you gain more than you lose when you take time away from your business. TSWS: 018 Dealing with analysis paralysis and being overly self-critical. TSWS: 008 How to set goals you actually achieve. TSWS: 005 12 solutions to manage overwhelm.